We absolutely LOVE getting feedback from PEM’s valued customers. Who better to speak to the quality and benefits of PEM, than a respected business that’s used it in their daily operations for so many years! Loeb-A-Rosa Kennels, an Owensville, Missouri kennel owned by Louise and John Loeb, has been using PEM’s Kennel Matting for over four years. This family run facility has been awarded a Blue Ribbon Kennel Award by the Missouri Department of Agriculture. They have a true passion for their dogs and take great pride in their operation. Loeb-A-Rosa Kennels’ first PEM application was typical of our commercial customers using the slip resistant flooring indoors. “I first used them in front of my sinks and grooming tables for my own comfort! The mats cut easily using a standard razor knife, so I could custom fit them in any place,” explains Louise. The soft construction kept Louise comfortable while the porous design allowed water to pass through, ensuring Louise would be safe in front of the sinks. It didn’t take long before the Loeb’s decided their dogs’ comfort would also be maximized with PEM’s Kennel Matting. 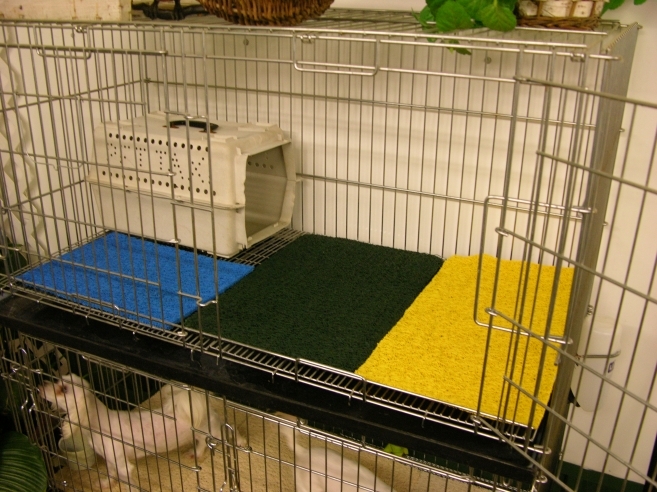 The matting provides a safe, comfortable and dry surface for the dogs. As a Missouri and USDA Licensed facility, Loeb-A-Rosa must follow specific compliance requirements, insuring a high quality of care for the animals. In accordance with compliance standards, kennels in Missouri are required to provide a "solid resting surface” for all animals. PEM Kennel Matting was awarded this distinction by the Missouri Department of Agriculture, making it an ideal application for top-quality breeding facilities. PEM Kennel Flooring has many valuable applications – from providing a slip-resistant surface to keep employees safe and comfortable to creating a comfortable, dry environment for dogs. Interested in learning more about PEM Kennel Flooring? Fill out our contact form or give us a call today!